Many correctable vision problems are caused by abnormal eye anatomy. Very few people have perfectly shaped eyes that facilitate ideal vision. Rather, most people have some degree of abnormal curvature or other anatomical irregularities that cause slight visual changes. Astigmatism is one common form of visual impairment that results from irregular anatomy. The clear front area of the eye is called the cornea, which is important for refracting light rays to direct them onto the retinal surface. Light rays pass through the cornea onto the lens. The lens is flexible, changing shape to further focus the light rays and ensure that they hit the retina. Light must bend at a particular angle to result in clear, focused vision. Any abnormalities in eye structure may cause light to be improperly focused onto the retina, preventing visual sensory cells from processing the images. Astigmatism occurs when either the cornea or the lens is abnormally curved. It is important to note that nearly everyone has some degree of astigmatism, as ocular structures are rarely perfectly shaped. When the cornea or lens has particularly pronounced curvature, however, light rays fail to focus onto the retina. This leads to blurry vision. Unlike farsightedness or nearsightedness, astigmatism causes blurred vision at any distance. Many people have astigmatism as well as farsightedness or nearsightedness. A comprehensive optometry exam checks your eye anatomy and vision for signs of astigmatism. Tests of visual acuity typically reveal some inability to clearly read letters on a distance chart. The eye care provider may also use a keratometer, a tool that measures the curvature of your cornea. By shining a bright light into your cornea and measuring its reflection, the eye doctor can assess the curvature of your cornea. Your eye care provider may also place different lenses in front of your eyes to determine if you have a refractive error and to what extent. 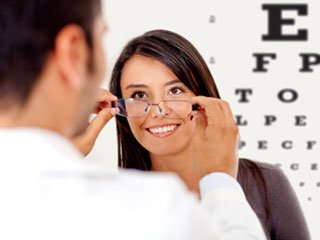 Most commonly, treatment for astigmatism consists of prescription eyeglasses or contact lenses. An alternate treatment is orthokeratology, in which your eye doctor provides a series of rigid contact lenses for you to wear for relatively short periods of time. These lenses reshape your cornea, allowing you to have clear vision. Although orthokeratology does not permanently change the shape of your cornea, it may help you go without glasses or contact lenses for everyday activities. Surgery is another option for those who want a more permanent solution. Astigmatism is very common and relatively easy to treat. If you experience any blurriness or change in vision, consult your eye doctor immediately to receive an optometric exam.